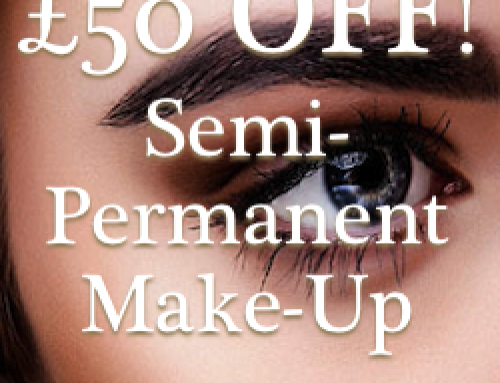 We have a fantastic offer £50.00 off the cost of a semi-permanent eye brow tattoo! This offer is available for a limited time only, so don’t delay…book today! 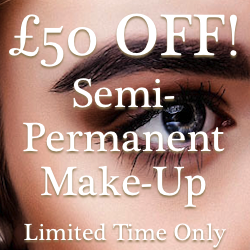 Ideal for women and men of all ages, semi-permanent make up is a great option for those who want 24 hour beauty without worrying about re-application, streaks and removal during daily life. There are also great for those who are allergic to conventional make-up, sports enthusiasts, those with poor eyesight or shaky hands, or if you simply find applying your make-up as a chore. There are two techniques used to apply a semi-permanent eyebrow tattoo, Hair Stroke/Feathering and Powder Fill/Solid Block. Each method has it’s own benefits and different individuals will be suited better to different techniques as each application will achieve different looks and are suitable for different faces. The hair stroke method has become incredibly popular in recent years. It is very natural, lifelike looking brow which essentially is created using the tattoo needle to create lots of little hair like impressions by implanting pigment in a line under the skin. The action of ‘stroking’ the needle through the skin to create a ‘hair like’ mark does not actually implant the pigment as deeply as the powder fill method. It usually needs to be retouched more frequently than the powder fill method, as it fades more quickly (particular hair stroke brows done in lighter colours). So if for you, the most important factor in your cosmetic tattoo treatment is longevity, I would probably not opt for the hair stroke technique alone. Also, in older skin, or skin that has been aged prematurely from sun exposure, the hair strokes do not stay in the skin as well defined as in younger, more elastic skin. The powder fill method is the more traditional method of cosmetic tattoo. It involves the application of thousands of tiny little dots of pigment, inserted into the skin, gradually building up a colour and a defined shape. The pigment usually lasts longer when applied in this manner, as it is deeper in the skin. Powder fill brows do have a more defined look about them than hair strokes, and some people don’t like this look as much, as it can lack in texture. Many people are fearful of this method looking too ‘solid’ or unnatural because it does have a more defined, solid look than hair strokes alone. However, it can be made to look very natural looking by not saturating the desired brow shape 100% with pigment to allow a defined yet soft/non solid look. Historically the powder fill/block tattoo had quite a bad name for itself, as in many older style facial tattoos you see these days. The reason for this was the pigments used were not really suitable for cosmetic tattoo and as a result they would fade to an unnatural colour over time. Cosmetic tattoo pigments have come a really long way since then, and pigments for brows are blended browns, blondes, and taupes, and all extremely natural looking, so you need not worry about any horror stories you may have heard from years gone by. 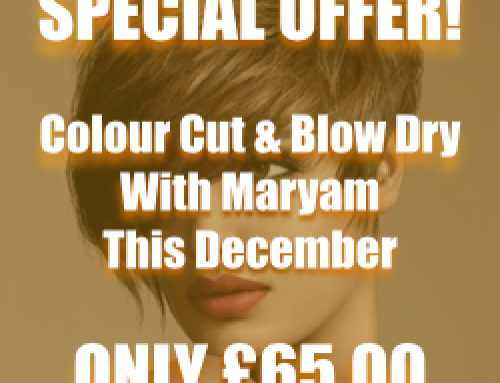 Special Offer With Our Creative Director In February! Help your friends & family relax too! 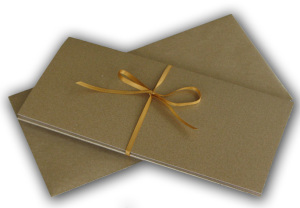 Give our treatments to your friends or family in the form of our gift vouchers, so that they can choose just the treatment they want. Simply call us on 01273 960881 or 07792 661865.